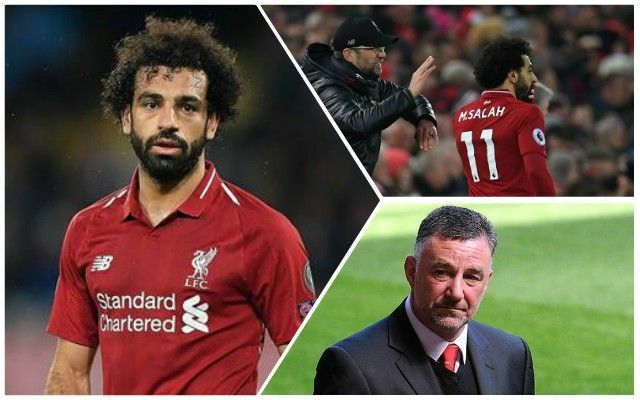 Former Liverpool man John Aldridge has outlined his fears over Mo Salah’s form – saying the Egyptian looked nervy against Fulham, and is putting the Reds’ title chances in danger. Aldridge has not held back with the criticism, suggesting that Salah must find his form soon if the Reds are to win the league. Writing in the Irish Independent, Aldridge explained: “Salah turned in one of his worst performances of the season at Fulham on Sunday – alarm bells should be ringing loudly. “His dip in form is now in danger of becoming much more than just a temporary blip. He was finishing chances without even thinking about it last season and that freedom has been lost in recent months. Salah has not scored in any of his last seven games for Liverpool, but has been impressive against the likes of Watford without getting onto the scoresheet. He’s certainly not been as bad as what Aldridge is making out. While he’s got nowhere close to the 44 goals he netted last season, he has the same number as Sadio Mane in the Premier League this campaign and may well retain the Golden Boot that he ran away with last year. Aldo’s point is that Salah needs to improve, which is true, but it seems a bit strong to suggest it’s more than a temporary blip. It’s easy to forget that he missed chances last season, too, and had he not been so incredible last season, we’d be viewing him very differently. It might take just one goal and Salah could go on a run between now and the end of the season – we certainly wouldn’t put it past him.